Rachel Brandsness, Lead Axe Wielder, was a foil that kept the crowd going. Since when do people show up for opening acts anymore? Especially third bill? With the support of 102.9, The Buzz, the only non-classic Rock station in town, local fans were there to support a local act that is diverse enough to play Popfest and the SXSW Conference. I think Nashville is ready to rock. On the same night that Maroon 5 and Train were playing at Bridgestone, a near sold out crowd where Kelly Clarkson was spotted having a good time, was taking hold as day turned to night at the War Memorial Auditorium. 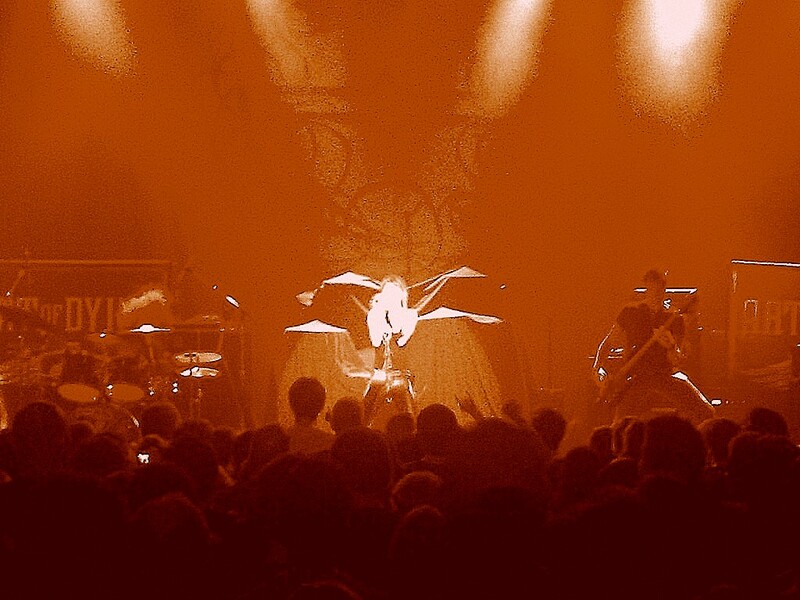 This was a unique opportunity since it was Evanescence only Nashville show this year, spending most of their time in Europe where they still have a rabid following weaving a fine line between radio ready songs and heavier then Dimmu Borgir Sonics. For some reason a tornado had touched down in Fools For Rowan Drummer Jordan Cullens’ hair, with his blond mesh going every other direction, he still managed to pound out a solid set. I don’t know how he did it, with all that wind raging around him, but, everything came off smooth. Art of Dying, whether it is about the Tibetan Book of The Dead or George Harrison’s song off All Things Must Pass, played a solid set. The Canadians have landed. Their most recent album was produced by one of the biggest Producers of Modern Rock, Howard Benson (P.O.D., My Chemical Romance) and mixed by the guru of Metal, Chris Lord-Alge. The main plus for Art of Dying is the vocal harmonies sans-vocal correction software. Not that they sound like the two bands, but, it was kind of like P.O.D. with Bon Jovi/Queensryche harmonies over the top. The most important thing was Lead singer, Jonny Hetherington’s shirt, a full reproduction of the AC/DC Powerage album cover. How can you not like the guy? Art of Dying has been on the radio with “Get Through This” but it was really the slow heavy stuff that included a cover of Alice in Chain’s “Man in The Box” where they really shined. Heavy and grooving worked best. This was really a celebration. 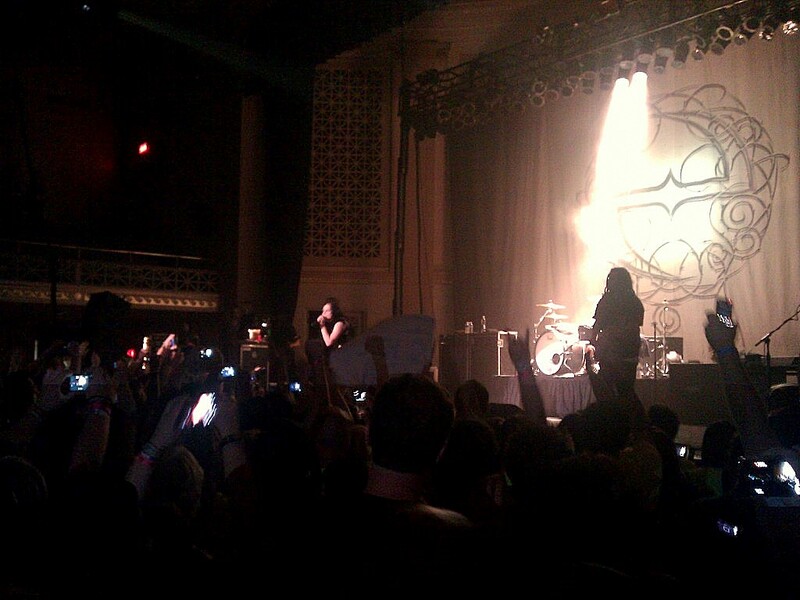 If you wanted to see Evanescence this year in the States, this was the moment. There were those that could say they were there and the rest will have to just understand why Amy Lee really is the Black Swan incarnate in her black tutu style skirt, black hair and the voice of a female operatic Viking. She conquered the world with that voice. In today’s Katy Perry “La-La Land” where selling a million records makes you on par with Michael Jackson, “Fallen” sold seventeen million copies with a beautiful balance between heavier- than- Sabbath and more melodic than Queen production. 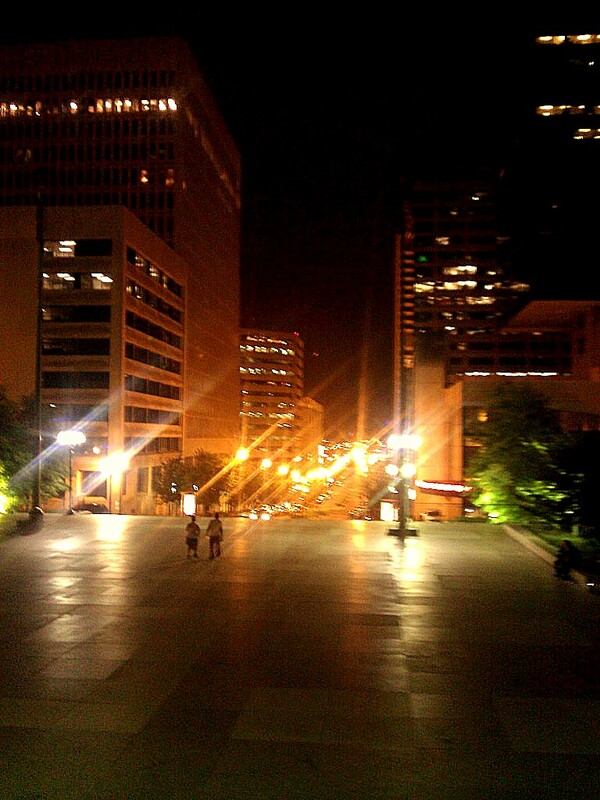 The story of the Little Rock, Arkansas band is only a stone’s throw from Nashville where they were discovered by Producer Pete Matthews, who is not widely credited, but helped to develop the sound that is now Evanescence. It’s always fun when you know the back story. 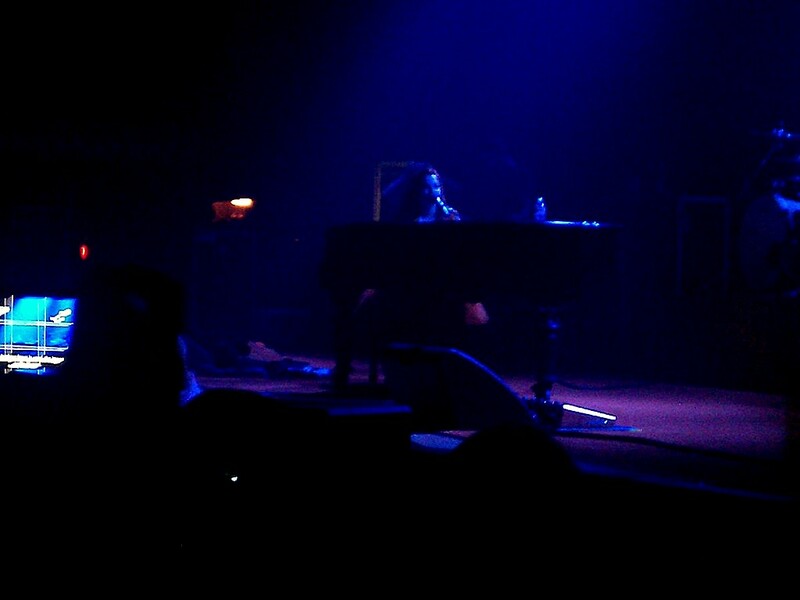 Amy stopped before she started when they brought out a grand piano mid-set. When she sat down to play, there was a string out of tune and she stopped, walked to the front of the stage and talked with the audience while a piano tuner did his job. With a voice like that, it wasn’t hard to believe she has a good ear. Evanescence’ drummer was insanely great. The blond hair, was it Taylor Hawkins from Foo Fighters? 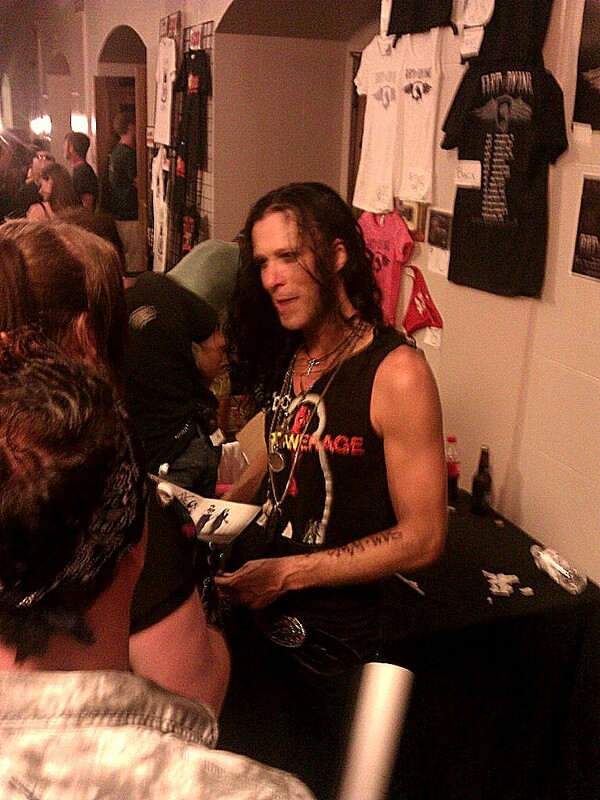 No, it was Will Hunt, who actually played with Tommy Lee’s band. Will Hunt has showmanship that goes beyond some stick twirling. He honestly had some hand technique that was amazing. He was tight as well. If you weren’t there, you missed it. There is nothing better than fantastic live performance. You can take your MP3’s and shove them…well you get it. It was a beautiful evening and one of the better shows this year. Editor note: I really appreciate the interest of Evanescence fans from around the world. Amy Lee is probably the greatest female Metal genre vocalist of all time. This report was to be about the show itself and it was announced from the stage, probably a local DJ who was the ringmaster, (also noted by those in attendance) that it was said this was the only U.S. show this year. Amy herself did a shout out for Fools For Rowan and Art of Dying for coming to play this “one-off” show. However to be accurate, I made editorial changes to reflect the Nashville show itself. As far as photos, I had an all media pass including photos, but they only let people with official laminates use real cameras to shoot the band. Security actually pulled people aside that had the photo access wristbands with real Canon and Nikon cameras and had them shut off their cameras. 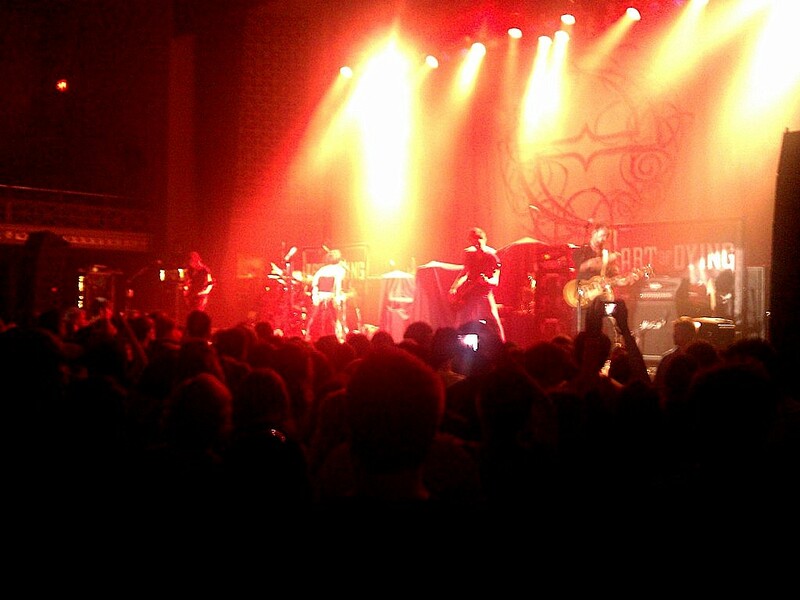 However, I am sure there may be pro shots from fans in the balcony or out of view of security that may have been taken. All I had was my droid phone. 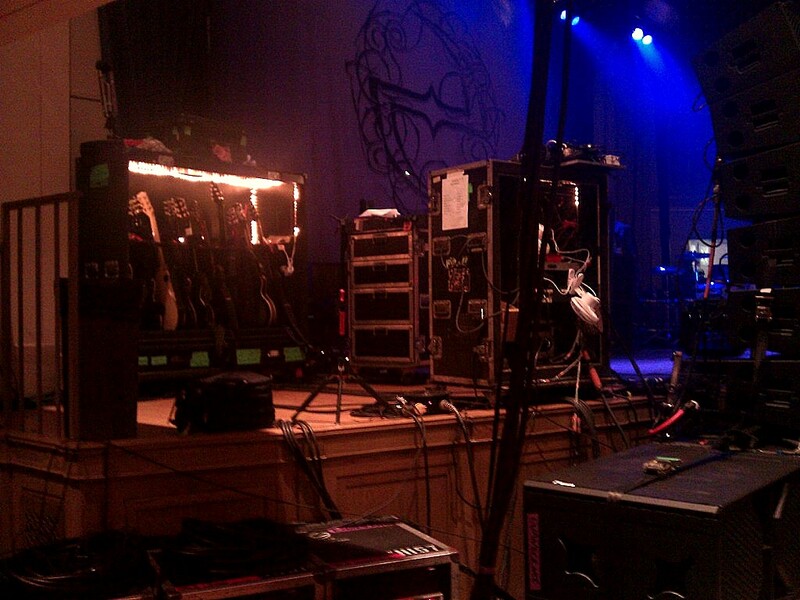 I think my only decent shot was the guitar rack. If you took a decent shot of the band and would like it posted here, send it to my email address with a note as to the proper photo credits. Please note your facebook or website address so that I can verify you did take the shots. I have had fans from as far as Italy and Russia that have been logging in. I am sure they would enjoy seeing them as well. Thanks again for your input and the encouraging words on the Evanescence message boards. – B.H. Note, the estimate of 1200 was mine during the opening set. The line was ridiculous for ticket will call. There was probably that many people trying to get in during the opening set. I don’t the War Memorial capacity, but I am sure it is over 2000 and I would say it was near sold out by the time Evanescence wad on.v1200 referred to the first set. Thank you for stopping by. Point well taken. Don’t trust stage banter. It was a “one off show”. Only show in U.S. this year”. It’s show business after all.